Histiocytosis refers to several serious blood diseases where the body produces too many histiocytes, a type of white blood cell. Keep reading to learn more, or skip ahead to see pictures and movies about histiocytosis, and links to other resources. In health, histiocytes are a normal part of the immune system formed in the bone marrow and spread throughout the body via the blood stream. They help to destroy harmful proteins, viruses and bacteria, and play a role in the production of antibodies. Histiocytosis is considered to be "cancer-like", but not technically a cancer. For many this distinction is meaningless, as the diseases are often treated by cancer specialists using chemotherapy and radiation, and around 15% of all cases result in death. Whilst most patients will survive the disease and some will have no further symptoms, others, around 50%, are left with a legacy of permanent damage to one or more organs such as the liver, lungs, brain and endocrine glands. The tale of a child with histiocytosis is often a tragedy of pain, disfigurement and hardship even after the disease is in remission. In contrast, some cases can spontaneously go into remission without treatment. No one yet knows how or why the disease can behave in such different ways. Doctors do know that histiocytosis is not contagious, not hereditary and patients cannot infect anyone else with the disease. Histiocytosis is rare and is often referred to as an "orphan" disease because it affects too few people to generate government funded research. No one wants to "adopt" these diseases. Because of this fact much of the progress in understanding the disease and developing better treatments has come from funds raised by families, friends and communities of children diagnosed with histiocytosis. To their huge credit, millions of dollars are raised each year! According to the University of California, San Francisco Medical Center, at least 1 in 200,000 children and adults in the US are diagnosed with histiocytosis each year, with the majority being children. The Histiocytosis Association (HA) states that 76% of all people diagnosed with histiocytosis in the US are children under the age of ten years old. In other countries around the world, similar numbers of children and adults are diagnosed, and the same low levels of research funding are reported. These are still significant numbers and many people will know someone whose life has been darkened by histiocytosis. I can't stress enough how important it is to make a donation, sponsor the SofiaMaze, or directly support a registered histiocytosis charity such as the HA. It is thanks to thousands of people like you that real advances have been made in the fight against histiocytosis. Also, unlike some of the bigger charities, where even the most generous donations can feel like a drop in the ocean, here every penny you give could make the difference between funding new research or no progress at all. Dry medical descriptions hard to visualize? So you read those dry medical descriptions, and it doesn't sound too good, but it's still hard to picture what a diagnosis of histiocytosis really means. 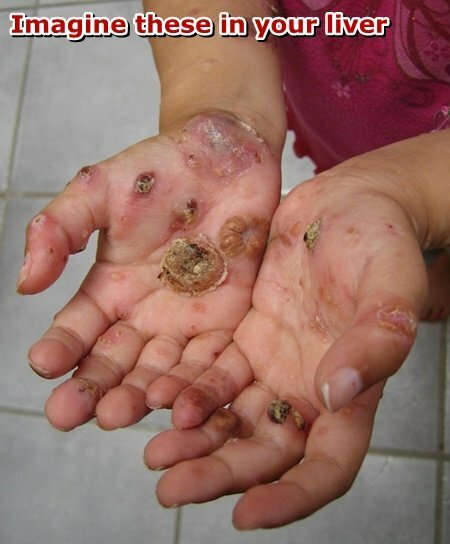 The following examples probably represent the worst side of the disease, but they are by no means unusual, these situations can and do happen to kids with histiocytosis. Imagine having one of your bones spontaneously break while performing the most innocuous of daily activities like standing up, picking something up off the floor or even just rolling over in bed. Imagine having histiocytosis in your lungs so that you pant from exertion just from getting out of bed and your peripheral vision is blacking out. Your chest and back hurt when you cough or try to take a deep breath, and you are constantly coughing. And each time you cough you have to spit out the blood that comes up. You're too busy struggling for breath to wonder how much permanent damage is being done to your lungs. 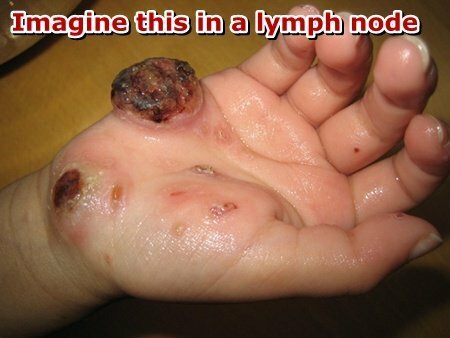 Imagine having extremely painful open sores on your hands, feet and body. Your hands are so painful that you have less grip strength than a two year old, and you have to use your forearms to push yourself up off the ground. 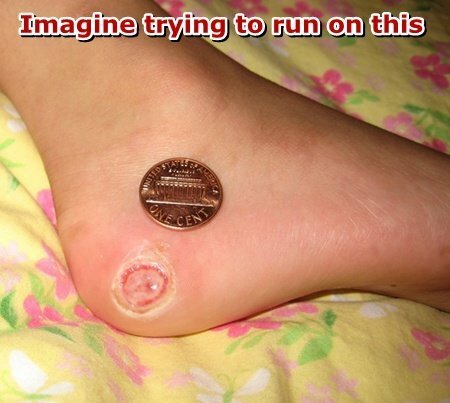 Imagine that the sores on the bottom of your feet are so painful that you have to walk around on tiptoe, and your heel cords become permanently shortened. Many people feel an overwhelming need to help when they see these kinds of disturbing descriptions and pictures. You can help too by using the buttons below to donate or sponsor the SofiaMaze. If you can't spare even a single penny then you can still help by sharing this story with as many people as possible. Every penny helps, and every new voice makes a difference. The HA provide some good information and documents about histiocytosis: the disease; symptoms; treatments and related articles. There is also a hugely useful active message board for patients families and their supporters. Very informative videos from some of the leading international experts on histiocytosis. The Histiocyte Society is a nonprofit organization, comprised of an international group of more than 200 physicians and scientists, committed to improving the lives of patients with histiocytosis by conducting clinical and laboratory research into the causes and treatment of this disease.